You might have heard about the #quiltsforqc initiative the Montreal MQG launched on January 30 after the horrible shooting at a mosque in Quebec City. The response we received from quilters the world over has been amazing, humbling and a little overwhelming. 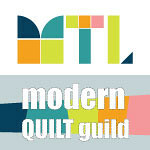 :-) You can read updates on the Montreal MQG's blog here. I did make a couple of blocks to contribute to the cause, but I also decided to finish a few quilts. Today, I would like to share my first #quiltsforqc finished quilt. I just love those house blocks - I love how different they all are... some pretty modern and some more traditional. The variety of fabrics and patterns used just makes each house so unique. I had such a good time piecing the blocks together and then quilting and finishing it. I decided to keep the quilting simple and fast so went with my wavy horizontal lines. I really do love using this quilting design for a fast finish. The Montreal MQG's April sew-in is this Saturday and we're having a basting party! So I'm pretty sure I'll be taking more quilt sandwiches home with me to finish. I will linking up at Crazy Mom Quilts for Finish It Up Friday and at Celtic Thistle Stitches for TGIFF. Also, if you're participating in the 2017 FAL, don't forget to link up your finishes here. While you're there, check out the tutorials the different FAL hosts put together for tutorial week. 2017 FAL - Q1 Finishes! Wow - it's been a full month since my last finish! This means I haven't spent a whole lot of time in the sewing room in the last month and that's not good. I did work on a house quilts for #quiltsforqc, but other than that, my poor Juki hasn't seen a lot of action. Then last weekend, I decided I was going to stay off the work computer, ignore the email messages piling up in my inbox and spend time finishing my Meadow Mystery quilt. This QAL, organized by Cheryl over at Meadow Mist Designs, started in July 2016 and the parade of finished quilts is scheduled for April 5 to 7. I chose Curiosities by Jeni Baker for my focus fabrics and the background is Kona Snow and Kona Ash. I'm really pleased with my choices of focus fabrics, but my background colours don't have nearly enough contrast. Also, as much as I love Cheryl's designs (I have used her patterns many, many times in the past) and this one is no exception, I learned that I don't love mystery QALs. I'm just not very good at selecting fabrics when I can't visualize what they'll look like in a finished quilt. The good news is Cheryl always has a "no mystery" version of her QALs so next time, I think that's what I'll do. For the quilting, I used my walking foot to quilt wavy horizontal lines that cross randomly. I really like the look of those lines and the texture is so nice. This lap size quilt is going to be making its way to Louisville, Kentucky in a couple of weeks. My friend and work colleage Patti is an amazing crocheter and she agreed to swap a crochet blanket for a lap quilt. I really hope she likes it! 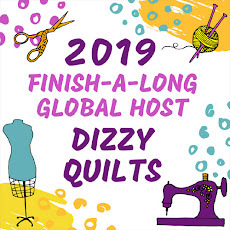 I will be celebrated this long awaited finish by linking up at Crazy Mom Quilts for Finish It Up Friday and at The Carpenter's Daughter Who Quilts for TGIFF. We are back with another introduction post by one of the FAL hosts in 2017. This month, we learn more about Abigail who blogs at cut & alter. Enjoy! Back in November I was surprised and delighted to open an email from Rhonda inviting me to become one of the global hosts of the 2017 Finish-A-Long. There are 13 of us in all and over the course of the year we'll be introducing ourselves. Nicky from Mrs Sew and Sow started off in January followed by Jess from Elven Garden Quilts in February and now in March it's my turn. Hello, my name is Abigail and I blog here at cut & alter. I found the FAL late in 2015 and couldn't believe how it motivated me to get things finished. I have always been a list maker and the FAL is no exception. My lists are somewhat larger then most people's, although I have certainly seen longer as well! I know that I will never get everything ticked off within the current Quarter but it does give me 1) accountability 2) a reason to tidy up and reorganise my studio each quarter to find those projects which have been languishing on shelves and at the bottom of boxes 3) it brings projects to the front of my mind and a lot of work goes on in my mind even before I get in the studio 4) if a project has been rolled over just one too many times I can then see that it's probably never going to get finished and I can pass it on (does that count as a finish?!!). Last quarter I had a particularly low completion rate and this one is shaping up to be the same but I have a few finishes and some projects are considerably further on! February was a really, really busy month at work so I didn't get a whole lot of sewing done. So this stash report isn't going to take very long. I have two finished projects for February, both of which were made with scraps. You can read more about each one by clicking the picture. The bed runner put a really nice dent in my black and white scrap bin but most of the other bins are pretty full still. Will have to plan more scrappy projects!